Property prices and rents in Dubai are expected to “move up” from mid-2017 as preparations for Expo Dubai 2020 accelerate, a new report by Knight Frank has revealed. “Government commitment to spending on infrastructure and facilities, along with the realisation among developers for the need to phase out projects in line with demand, lead us to believe the real estate market in Dubai has become more mature and resilient,” company associate partner Dana Salbak said. International corporates are also expected to boost their commercial activity, utilising Dubai as a regional hub, "prompting demand for office space and more residential properties”, she added. These factors will lead to an “uptick” in prices and rents during the year, said Salbak. Last month the Expo organising team said 47 construction contracts worth US$3 billion would be awarded to local and foreign companies in 2017. They will include the construction of car parking, three districts that will house most of the pavilions, plus public areas. That would leave Dubai on track to complete most construction a year before the event opens in October 2020, it said. Deals worth more than $545 million were conducted last year. Back in 2014, HSBC estimated that overall Expo-related spending, including private sector projects, would reach at least $18.3 billion. Development of the expo site, which the government says will cost $6.8 billion, is one of the biggest projects in Dubai's history. It will help fund the development of the new Dubai South district where the city’s new Al Maktoum International airport is also located. Officials say the spending will be funded through a combination of equity from the government and debt backed by other nations' export credit agencies. 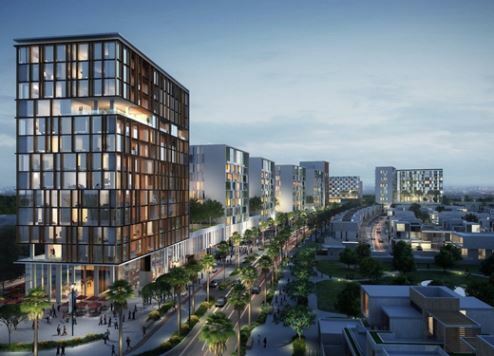 A huge exhibition centre will be built on the 438-hectare (1,082-acre) Expo site, plus thousands of new hotel rooms and an extension to Dubai's metro line are also planned, with some projects already under construction.